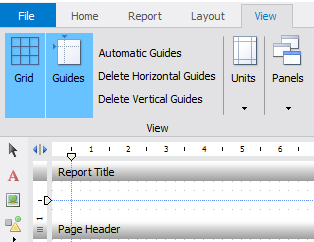 Guides in the FastReport.Net designer - Fast Reports Inc. 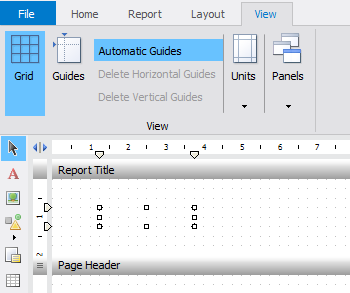 When designing a report template, you often need to build controls on the same layer. In FastReport VCL, for example, this applies to the grid on the report page. 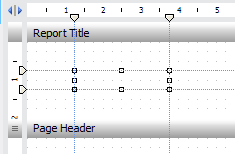 In FastReport.Net grid represents only a point of intersection of the lines in the ground. This is not so distracting as the line but at the same time helps to build objects. You can add these lines manually or use the option: Automatic Guides. That is, if you have at least one control on the report page, you can align it with respect to other controls. To manually add guide lines, choose a location on the vertical or horizontal line, and double-click the mouse. You can add any number of tracks. To delete the desired line, press and hold the slider and move it out of the page. No matter in which area. We remember that when you move the line that passes through the object's border, it will move together the line. It is better to remove such lines by moving the slider up or down, not sideways. To quickly remove the designer provides two buttons on the toolbar: "Delete the horizontal guides" and "Delete vertical guides." Their designation is clear from the titles. It should be noted that if the option "Automatic Guide," then there is no way to manually add a line. Moreover, previously written lines are removed. But, all the objects previously added, will be provided with guides automatically. If the abundance of guide lines prevents you, you can disable them using the "Guides" button. Moreover, all sliders will be saved, and you can always revert to the line again by pressing the button. Many novice report developers neglect such means as "guides", but in fact it makes designing of template is much simpler and faster. Still, nice to deal with a simple and convenient tool.